JTR Walk article on K-W. This time, instead of being the subject of a Killer-Works article I'm the author of a special Friday edition piece. Regular newsletter subscribers have the chance to score a prize package by guessing the reason for this irregular edition, dated Friday, August 31. 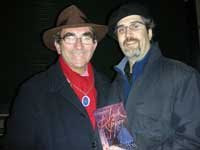 The main clue is the article's subject matter: a review of the the most celebrated of London, England's Jack the Ripper Walking Tours. You may have been a winner if you guessed that today, August 31, is the anniversary date of the murder of Mary Ann (Polly) Nichols, believed to be the first victim of the notorious Whitechapel killer (a.k.a. Jack the Ripper). This weekend I attended Rue Morgue Magazine's annual Festival of Fear horror convention in Toronto. Accompanying me was Jill Cooper of Killer-Works.com, on her first foray into the FOF. We're here partly to gawk and be fans, and partly to do scope it out to get a dealer table for FOF 2008. For the uninitiated, the FOF is part of the monstrous Fan Expo Canada convention that covers Comics, Sci-Fi, Horror, Gaming, and Animé. An estimated 40,000 bodies crowd through the turnstyles during the 3 day weekend. I'm not sure if that number represents just those in the horror section or all sections combined. But that's a lot of serious geeky fanboy/girl types all under one roof. Feels like home. Tons of dealer booths, celebrity autograph opportunities, screenings, games, costume contests, and more. 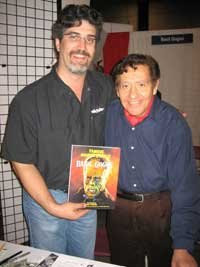 My convention highlight: meeting legendary Famous Monsters of Filmland cover artist Basil Gogos [pictured, right]. Lovely man. Way too many memories bubbled up while going through his decades of artwork. Can't wait until next year.